Super Hero Boy: Edge of Darkness Bluray dvd review! Edge of Darkness Bluray dvd review! Ok maybe this household is a little overly obsessed with police tv shows, movies, and drama these days but we can't exactly help it as Chris IS a police officer. Actually this is one cop drama I have no desire to play out in real life. Mel Gibson plays Thomas Craven a rather edgy Boston police officer and what appears to be a single doting father to an adult daughter Emma. Emma comes home to visit her dad only to be gunned down the moment she walks through the door. Of course it appears that the bullet was meant for her father, or at least that is what you would immediately suspect, but Craven is determined to track down who and why his daughter was killed. The plot is actually great, Emma is not at all as she appears and Craven keeps uncovering more and more secrets she has been hiding. The search leads him to his daughters workplace where she was working on a top secret government project and her boss is one creepy guy. Usually within seconds Chris has guessed the ending to just about any movie we watch and thankfully this one kept him guessing. Craven has some help from a mysterious informant who turns out to play a much bigger roll in the whole story than he is letting on. I've actually been looking forward to seeing this movie since I first saw the in theather trailers. Seeing as we rarely get the chance to go to the movies I had to wait a while to see this on DVD. Needless to say it was well worth the wait and Edge of Darkness was by far one of the best cop movies I've seen in awhile. (Not to mention one of the best Mel Gibson movies I've seen in a VERY long time!) We got a chance to check it out in blu-ray and I have to say the sound and video quality was excellent. Ever since we got our bluray player I have to admit other than movies with tons of special effects (as I just prefer seeing that on the big screen) I've really not missed going to the theater at all. Seeing as this movie is filmed quite often at night and many parts of the movie are quite dark watching it on bluray was a big bonus as the picture is super crisp (1080p HD) and the sound quality is excellent. 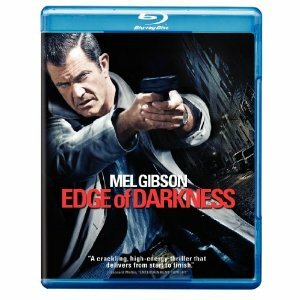 Edge of Darkness on dvd and bluray is available right now and you can pick up your copy on Amazon ! Disclosure: I was given a copy of Edge of Darkness free of charge, we were not compensated for this post in any other way. My opinions and comments on items we review are always my own and are never influenced by sponsors. Gonna put this one on my DVD to do! Ashley do you guys have bluray? I can let you borrow it. Who is Ashley!!?? Ha. Nope girl, we cheapos!! !